I was dreaming last night about this last slice. I was surrounded, in my dream, with friends, many Slicers. I would chat and then race to my computer and write. I would chat and race back to my computer and start over. I had so many friends. I had so much to consider as I created this last slice. I love writing but I am not really interested in writing novels, or poems, or plays or ever short stories. That came clear to me during the writing retreat I attended. I was distracted. More interested in capturing moments with my cameras. I love writing these Slices- in the morning, in the evening…afternoons? not so much. I love creating videos! I really love creating videos in fact, I created these three videos below in the month of March: Something for the Hudson Valley Writing Project, a piece for this Slicer Community(loved that one) and then a shower video for a very close family of wonderful friends. I love writing Slices in foreign lands even when the internet slows me down. Ahhh… Cancun, I miss you so. AND I love being a part of this community. I love Slicer Love. I love reading Slices and commenting even though I didn’t comment enough, as much as I’d like but hey Stacey, this community keeps growing beyond all expectations,right? And of course, I love comment love even when I wasn’t always commenting back. What a way to spend March. Can’t wait for March 2016…. RIGHT????? Good thing SOL Tuesdays will keep us together. This entry was posted in March Marathon 2015, Two Writing Teachers and tagged #sol15 #two writing teachers. Bookmark the permalink. First comment for you too!? 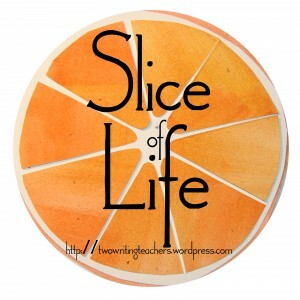 I am a slice writer too. Not a novel or short story writer. A picture book, now that would be lovely, but I don’t think I have the grit for pursuing that option. I love the stories you tell with your camera! Thanks for reading and writing! I never considered myself to be a writer of any kind. These Tuesday slices and the two March challenges I have participated in have changed my mind. It is all thanks to you and all of the pother slicers who have encouraged me through your kind comments. Thanks, Bonnie. I look forward to your weekly posts. Your video slices are amazing. I think I have the writer thing down, but just this weekend the extended writing pieces were not working for me. Yes, I was writing but I was itching to work on a digital piece. I have a list of pieces to be cooking and new tools in my software bin. All good. Bonnie, you keep me interested consistently in what the visual can do for communicating. I’ve been reading more & more, having students do more ‘visual’ work, think it enhances our creative thought, & much of that comes from your words/videos/photos. You may not be the writer as you think it, but you are a story-teller! See you on Tuesdays, & thanks for the words today! Thank YOU! I like that, storyteller! You can do both, which is a special gift, my friend. My mom always told me I was a great writer (don’t all moms say that?) but I have never thought of myself as one. I could never stay with a story and poetry was fun but only if it was an assignment–or goofy. Finding this community helped me find what kind of a writer I am–or at least what kind of writing I like. Thanks for your comments on my blog. I love your avatar! See you Tuesday. I love how you tell stories with words and images. Looks like you’ve been having a lot of video fun lately! I look forward to your posts written in the foreign lands! Your videos and slices expand my horizons! See you next week! I love your photos, videos, and stories, Bonnie. Thank you for sharing all those moments with us! Always excited to read your slices, see where you are. and what’s happening in your little corner of the world. I love the video that you created for our community in March. We don’t have to wait for 2016, there’s always next Tuesday!